Yesterday, it appeared reasonably likely that a little more upside would occur on Monday, and that did happen, although the market exceeded my ideal top-end range by a couple points. What can I say: it's not an exact science. Going back to last week, I was expecting at least a minor turn either Friday or Monday. As I write this, the futures are down about 7 points -- certainly not a ton, but if it holds through the open, it's at least confirmation of the minor turn I expected. The question I can't answer with a high degree of certainty yet is if this is a major turn or minor turn. My best guess of the very short-term counts suggest the top is in -- but as I said a minute ago, it's not an exact science. 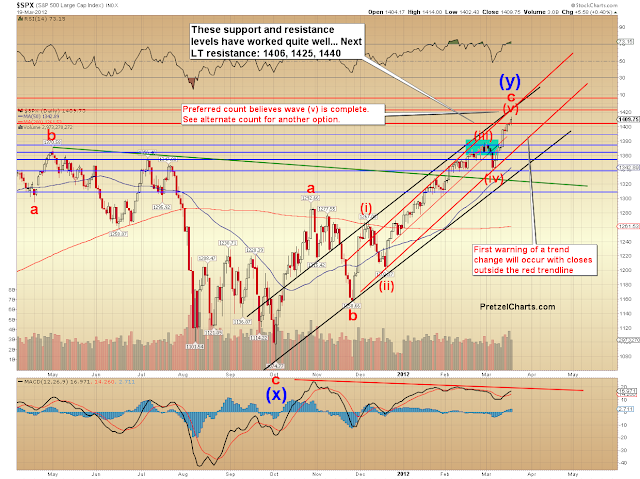 Fortunately, there are some levels which will invalidate each scenario, shown on the SPX chart below. If the black waves 4 and 5 scenario plays out, my target for 4 is shown as the yellow box, and my target for 5 would be 1425-1440. We'll have to see the form taken by any decline to help confirm or deny my current view, ideally before the invalidation levels are reached. It is quite a bit premature for bears to jump for joy. There are still lots of options on the table, including the possibility shown above, and the possibility that this turn will only mark the top of wave (1) of (v). I've drawn a long term chart to illustrate how much farther the rally could run if that's the case. Note that I do not believe this is only wave (1) of (v) -- I think the two scenarios shown above are the most likely. But the wave (1) of (v) potential is entrirely possible, and this rally has continually surprised to the upside, so I think it's important to be aware of the potential. Below are two long-term charts, one showing the preferred count, and one illustrating the alternate. Next, some supporting evidence from the RUT and NYA. While the count appears to be roughly complete, the RUT has broken out of an inverted head and shoulders pattern which targets 876 -- so as long as it trades above the breakout level, bears should be very cautious. It it breaks back below the blue line, that target will be suspended. Next the NYA, which also appears to have completed a five-wave form. And the NDX, which also appears roughly complete. 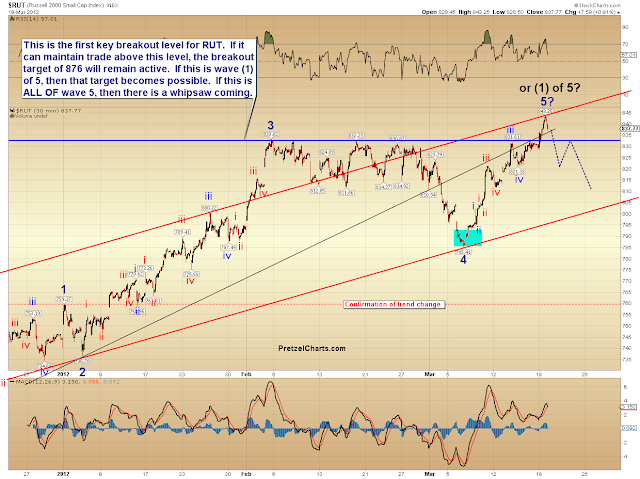 The NDX is one of the indices causing me some doubt on the waves 4 and 5 scenario. If the wave I'm counting as a failed fifth is actually a second wave, then there's another down/up still coming. And finally, the devil's advocate chart, to balance things out and provide perspective. Virtually every major index has broken out over key resistance. 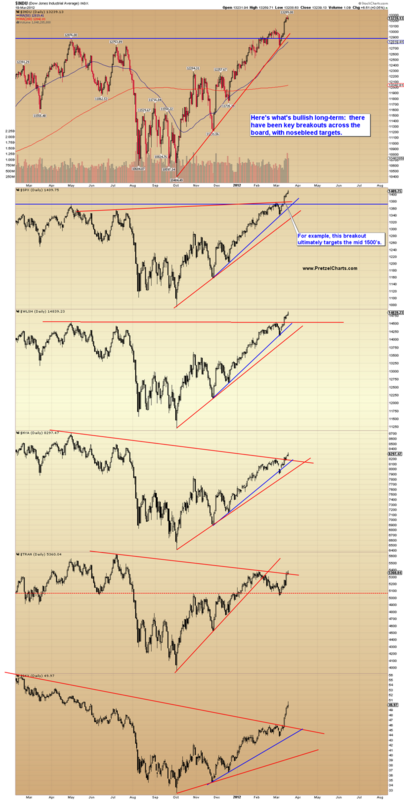 If one only looked at these charts and used no other form of analysis, then one would be bullish on this market. However, there is one key bullish ingredient that all these charts are missing, and that's a successful back-test of the breakout levels. The real test will come when the market heads back toward those levels. If the decline is bought, and the market bounces at the breakout levels, then the wave (1) of (v) scenario previously discussed may indeed be in the cards. If the market can't hold those levels as support, then that's called a whipsaw and usually leads to a strong move in the direction of the whipsaw -- in other words, in this particular case, it would mean "look out below." Right click on the chart and select "open in new window" to bring up the full-size chart. In other news, Apple announced a dividend on Monday, prompting several analysts to further raise their price targets on Apple. Several new targets are actually numbers which are so huge as to be purely theoretical, and which have previously only been applied in quantum physics. Sometimes this type of "everything's awesome!" awesomeness breaks out near tops. We'll see if that's the case here. In conclusion, I do feel the bears are going to have their time in the sun very soon. My best guess is that the top is in, though I'll allow a small margin of error regarding the waves 4 and 5 scenario previously discussed. Obviously, there's no confirmation yet, but once a few key levels start to crack, there will probably be a lot of people heading for the exits in a hurry. Do remember that tops usually take time, so it may still be a little while before those key levels are claimed. Trade safe. Morning PL - reading, watching and learning - thanks. Quite a splash on that chart, but what does it mean? I remember seeing Mark Haines interview Mr. Nenner, and Haines actually said something very close to "Well, sir, if your system/predictions are so good, why aren't you using them to make a fortune for yourself?". It was so incredibly insulting. And Mr. Nenner, to his credit, gave Haines this amazing *look* and said "Because a man only needs so much money. After he has enough for his family, to have a home and to eat, he doesn't need any more." Haines promptly shut up. Good morning Bob_E. You'll have to forgive me as I'm new to these parts. Who is 'Nenner'? I take it you trust/follow his 'work'? Thanks. He's had some remarkable predictions and a few blunders.....but over all, I'd give just about anything to have his skill/knowledge/system. timing of my predicted drop (1/2 hour from 8:15 am) off but possible bear flag may be appearing on the 15 & 120, not finished yet, will be interesting to see how usual bullish opening is played. http://charlesnenner.com/aboutus.php He has had some very remarkable calls/predictions, but like everyone in this business - has also had his share of losses. Here are my es tgts if this is the EW4 retrace on the 120 chart. It may be the beginning of it. Sorry, I deleted the image on Screencast by mistake while cleaning up files. I've since uploaded a replacement image and patched my post on the blog. But if you're using the link from the Disqus email, it wouldn't work. Here's the new link. http://www.screencast.com/t/y4fM0nIbJ3 -- So sorry! That wave down looks impulsive. 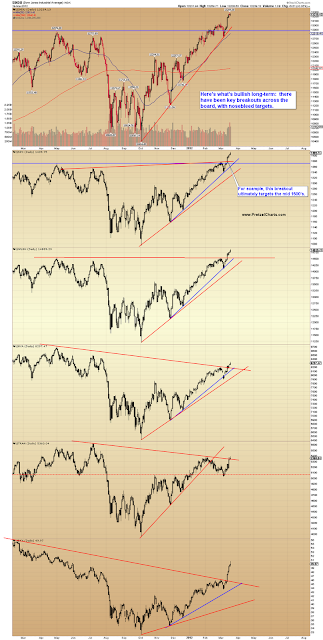 $TRAN & $RUT down almost twice amount of $INDU, $SPX, ES etc. LMAO! Will ya just look at that? Just look at that! ... Huh, you playin possum with me again? What the hell is that? A possum? Nenner made some good calls before, but these calls were 1-2 months early. In 2009, he called a market bottom in Feb, we actually had it in March. An interesting call he made in 2010 was that there would be a war by 2013! He is worth listening to....sometimes he is very hard to understand (his writing) but he has a system that serves him well. Don't know of anyone else that has been as accurate with regard to time and price. Point difference between future and cash, anyone? Great site and Comunity PL! I am new PL reader for about 2months now, missing a US/EUR update :-( ...but looks as if the trendline holds for further up? I think there is a case to be made for this wave to be the 5th and last in INDU. Top is 13,355 thurs or fri. Working off dailies that aren't locked yet for the session of course, I'm getting fairly clear indications at this point that we have ONE more small leg higher ahead of us into the end of the week. What is strange to me at this point, given last month's action, is how emphatic UVXY etc are that all is well, while the indices may still have a bit more downside to complete later today or tomorrow before that last upleg gets going. Clear divergence there, but opposite the way one might expect .... with volatilities moving higher along side the mkt. I suspect UVXY etc are just setting up their final lows, ahead of the turn. It's interesting that several blogs have been claiming that the cumulative NYSE Advance / Decline line has been producing "extremely negative divergences" over the last month. Nothing could be further from the truth. The cumulative A/D line made a new high last Tuesday confirming the new highs in the major market indexes. As of yesterday's close, it had been diverging in a non-confirming manner for 4 days, but in a miniscule manner given that the A/D was only a net -342 off of last Tuesday's high. This is a classic technical indicator, and can be most valuable in helping a trader to identify and confirm the trend. Nothing unusual about this indicator developing a small divergence over the last week. 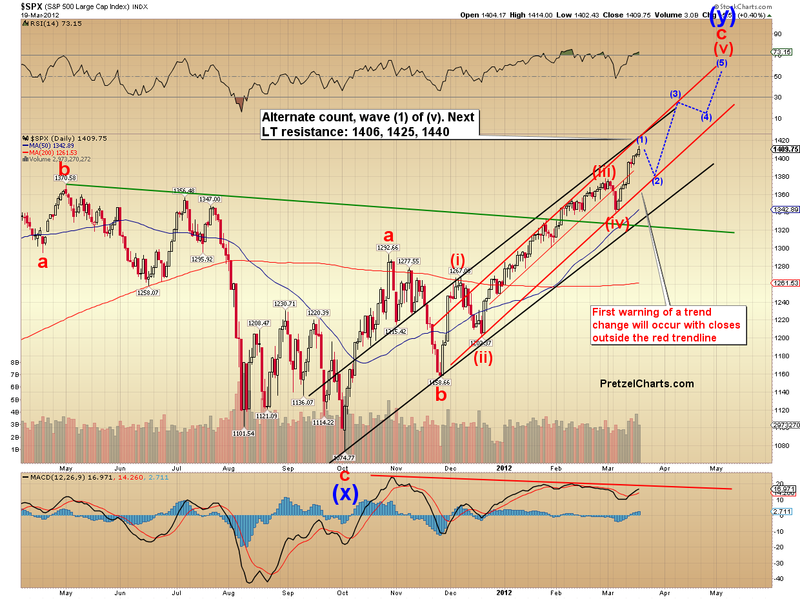 The KEY will be when the market moves back up after a pullback ( wave 4, then wave 5 ). Upon new highs in the indices, it will be important to then check where the cumulative NYSE A/D line is, and whether or not it was able to get above last Tuesday's high to CONFIRM the move. Here is another's interesting view, Fibarchie. From my view I do not see a h&s, but a drop from somewhere up here once this retrace is over. Here is my view now ~ 'nother drop set up appearing. Remember if down $INDU 120 will retrace to minus 70 to 90 (usually ~ 80), then drop to 140 EOD, if I am seeing this correctly..... this may come into play tomorrow, not today as this type of action should start very early in the day for carry thru. Everyone should be alert that there might be a massive rally from about 2:30 PM to the EOD. there's a case for SPX too. Looks like the "shorts" are going to be short some cash after that GAZ run. I guess J.T.Barnum said it best..."there's one born every minute"
I'm glad you didn't play as well. I'm a junkie and I enjoy the challenge, but that one had me on the edge of my seat the entire time I was in. Feel sorry for the "shorts" that were forced to cover yesterday...but not sorry enough to want to give back the money. Mama needs a new pair of shoes.....stay well. NDX tops at 2,787 ? Possible. Always interesting how the market react to these old trendlines. Brief support turning back into resistance? 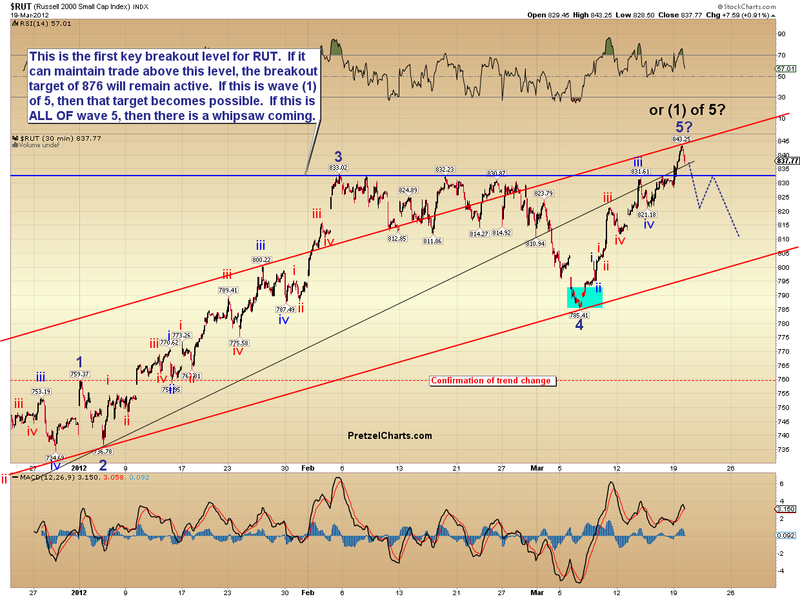 The bounce looks corrective so far, so I'd expect another wave down. Could get a decent little pop if it clears that trendline first. Good afternoon all. This is quite amazing. After breaking out and falling back in again, the RUT is right at the tip of a triangle formed by the upper trendline of May/July 2011 highs and Oct/Nov 2011 lows. The 15 minute chart shows this better. Right now, I'm short but have stops set and ready to fire. It's about to do something impressive. VIX option update.. VIX expiration is tomorrow.. 28 29 30 April calls . Why is there such a divergence? Obviously you're taking a shot at this chart, since I've been the only person I'm aware of who has been pointing out the divergences you speak of. They exist whether you care to acknowledge them or not. So I'm not sure what you mean by "Nothing could be further from the truth". looks like I got that Amzn trade dead wrong.....DirtRockGuy62, what led you to believe it was going to 193 again?...looks like you were right. Looks like CVX is giving up the ghost. Floor please? Discovered your post through Minyanville. Was an EWI subscriber until I taught my parrot to say the same thing everytime I entered the room. Now, not so much. Thanks for taking the time to comment on Elliot Wave in a manner that can be believed. PS Lived on Oahu for 30 years and still miss it after 10 on the mainland! I have no clue. A number of days back, there was chatter here that TVIX is not good to buy because of the large amount of premium and I think some ppl here jumped over to UVXY. Though I didn't say anything, I didn't think reality could be so clear cut. So this is showing that the advantage can well flow the other way. Why? I have no clue. Maybe it's because of the limited number of shares of TVIX in existence. They're not making them anymore. .looks like VXX was taken down to the low of july 11'. after March VIX expiration tomorrow may be the turn higher once the rollover is complete?.. OK, I'm trying here. Is he saying that buyers expect the VIX to go up in April and May? And, to the point, how has UVXY managed to go down so much in the face of an upturned VIX? Need a wall chart with the straight talk on TVIX, UVXY, VIX and VXX. Pray tell, what did your parrot say? Looks like TLT is warming up in the bullpen. Weekly and daily stochastics are very low (under 18) and appears the daily Sto is turning. Heads Up! You and your assumption are highly mistaken. Your chart has nothing to do with my previous post, which discussed the CUMULATIVE nyse advance / decline line and used the word CUMULATIVE no less than three times. I strongly suggest that you look up the word CUMULATIVE in order to better understand the post. Thanks for your comment....I did backfitting and over optimazation on 243 issues dating back to 1948. Curious thing is...no losses. My guess: "P3 is coming! P3 is coming!" Good. Some ppl (not on this board) were calling for its breakdown to continue, but I thought it was actually gonna bounce. I think it's going to bounce as well according to its 60 min. chart. But when I look at the daily chart, I see a whole other bearish picture. I realize that normally when the bond fund tanks, equities soar... and I believe most people who are expecting a pullback in equities are cheering for TLT to surge. Count me in that camp. But it is what it is... the bond fund looks like it's ready to take a nose dive, at least on the daily chart. Probably after a little bounce sometime soon though. I wish I'd bookmarked an article I read yesterday that discussed why rising yields this time around are very negative for equities. It was talking about why "this time it's different", a phrase that 99% of the time will draw a lot of laughs and guffaws at he who uttered it, lol. But it happens. I'll see if I can find that article. If so, I'll post the link here in an edit. I think it's part of the scripted play. PL was saying $133 needed to hold for a bounce (final one) to $155 and I am of like mind. A scare...moving the market down and bonds up would be a perfect scenario for a first wave down in the equity markets and a final wave up in the bond market. My hands are sweating. It seems more than likely it may go down soon after this counter trend up (it may go up about 1400.75 ES) so be careful, DD. Pretzel Logic called the S&P March 2009 low to the day and was off one point! 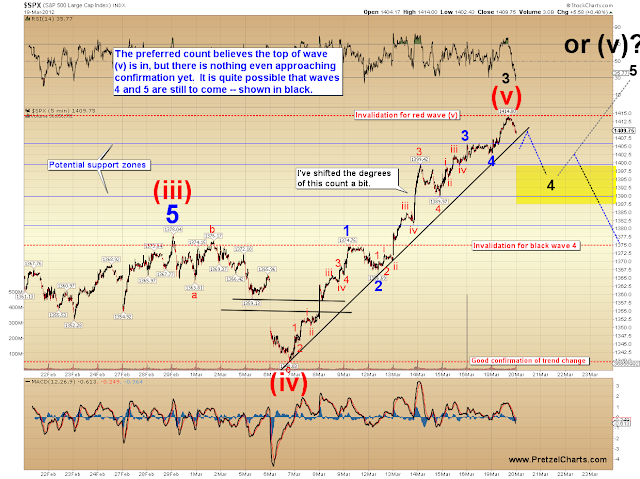 we could be rounding the last corner -- can an EW have corners? -- day trade call, now setting up for next down move. So h&s or no h&s. That's why I'm here....although I didn't know that until just now. Thanks. Great stuff, DD. Thanks for sharing. there's a gap to be filled first , at 1,409.12. NDX. Fearless, NOW you're talking. An earthquake with a magnitude of 7.9 struck 108 miles (174 kilometers) east-southeast of Acapulco, Mexico, according to the West Coast and Alaska Tsunami Warning Center. The EWI gang is infamous for calling the start of "Primary Wave 3 Down", a.k.a. P3. I believe they first called for it in Aug 2009 and after the start of nearly every correction in the market since then. Right on schedule, as per last week's piece on 189 day cycles. It is a good area for shorting, but VXX is not confirming it. It is good to see you posting again. Welcome back. I think I will begin shorting this market aggressively once AAPL loses the $600 level with any sort of force. I'm guessing that will be either this afternoon or tomorrow, but I'm trying to sit on my hands until it happens. Also, while I think AAPL will probably hold $600 today, a quick push over $600 with a strong failure right after would seem very bearish to me! See my post below to DD. It has reached its target (1400.75 ES) for this counter trend so it seems that there is a very high probability for it to go down. I just can't find the article, but this video speaks to the exact same argument... that rates are rising in response to inflation and how QE is actually designed to fight "deflation". Therefore, no more QE and rates are rising for the wrong reasons... not due to a robust economy but due to inflation during a declining economy. It's definitely a nice short clip worth watching. SLV down to 31 - is the 27.62 target still alive and well? Going to go long here.....(put my aluminum foil around my head) on HPQ right here at $24.04. Stochastics (hourly, daily, weekly) are all low and the stock has been beaten up pretty handsomely. 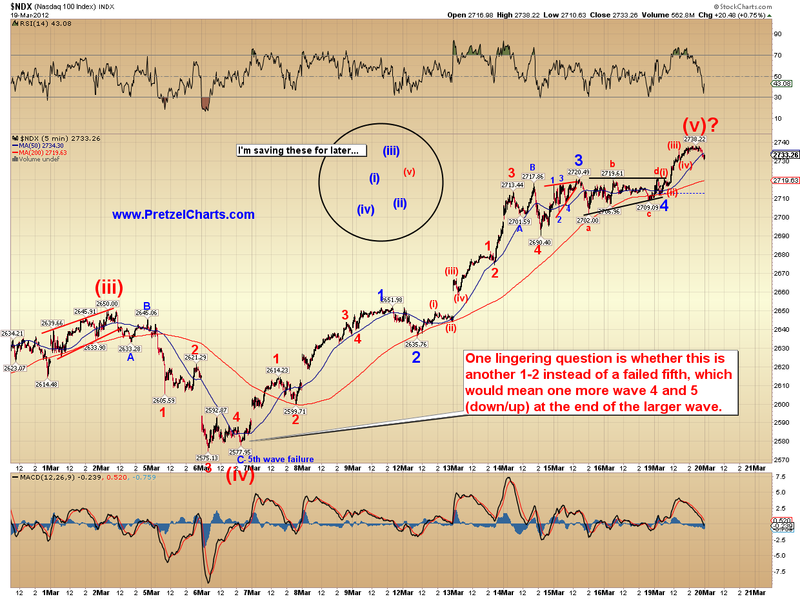 I figure this is wave four and needs to be a complex correction, so I think HPQ has the capacity to run to $31-32. Like Mr. Fukito says...."Aw in"
Should I even bother to fix the toilet tank? I'm wondering if Monday's pre-market high of 608.31 for AAPL will act as resistance. You probably shouldn't get to like me too much. Sometimes I fart I like it. Here's what I'm looking at on the Russell. I think it might rise to touch the underside of this trend line. It might make it. It might not. It might surge right through it. I don't think it even makes it. But I could be wrong about that, in which case I will fart to express my displeasure. Then YOU get to tell the Mrs. why. Actually, the recent Presidential Executive Order signed on Friday night is somewhat boilerplate from just about every other President on a lot of things....BUT there are a few things that are pretty much SHTF type stuff...apparently, the gov't is putting in place some real end of the world type stuff....I knew Obama was a prepper. I thought you were going to wait for 21 something. You did quite an analysis on HPQ and I looked at it. But there were so many points of interpretation along such a long timeline. I think it was DD. It's OK...I've never farted, but I am rumored to belch....What you said....it sounds right. I just want it to fill that gap and then sink like Luca Brasi. Short AAPL (very small!) 606.80. Stop 611.01. Crossing fingers! (might not hold overnight either...might wimp out!). I think this is a complex correction and the C wave up will carry the stock from here to the 38% retracement level of wave 3 down, which is at $31-32. Worse case scenario.....I own the stock and would be buying more once it gets under $21. Yes, I understand that you look at the cumulative and I appreciate the value in that chart. My only point is that you keep taking shots at me for even showing the chart which you referred to above. Why do you have to do that, constantly try to make it appear that your points of view are more important and more valid than those of others? They aren't. In some cases they may be "as valid" but they certainly are not the "only opinions that matter". The divergences on the chart I presented are as valid as they ever were. It is obvious we are at odds on this topic because you are referring to the "cumulative" (which is perfectly valid and legitimate), while I am referring to the "non-cumulative" which is equally as valid and legitimate. As you may or may not know, the data I show on my chart does affect the chart you show. It will show up on your chart soon enough. I'm just pointing out that if the deterioration in the numbers of advancers continues, the market is in a heap of trouble. At no time did I say or imply that the deterioration continues because I don't know whether or not it will. But I do know what's happening on that front at the present time. And now you do too. There's nothing wrong with what I've presented. So I, and everybody here, would appreciate it if you would just present your case without disparaging the contributions of others. Are you capable of doing that? eur/$$ ben dropping steadily al afternoon, not a huge amount but down. but my clock is running out now. after she got hit with a falling corn kernel the other day – YIKES! that standard for every administration? 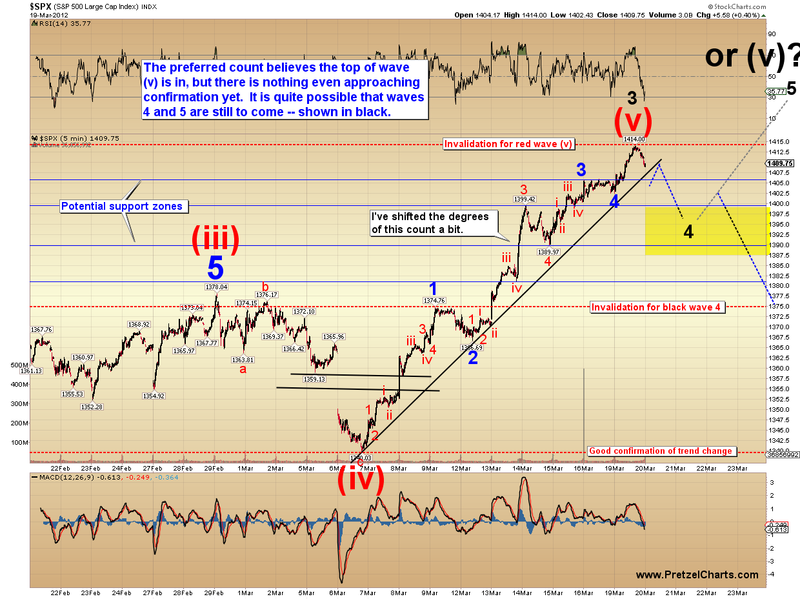 I'm thinking this is the way the five wave C wave up should unfold. Wave 1 = $26.80, wave 2 = $25.38, wave 3 = $28.62, wave 4 = $27.39 and wave 5 up could go to $31-32, but I will have a sell in at $30.15. Looks good on paper! Who is this Fukitu character you keep mentioning? Prechter claimed P2 to be over with and initiated his first SHORT position at roughly 1000 SPX and 9600 on the Dow Jones back in August 2009.
today was pretty much a reply of 2/29 to 3/01. EWs or indicators did not work, only recognition of a previous pattern worked. No. I am short the market through a position in SDS, a small position in FAZ, and a small position in SDS April calls at 16 . No position in ES. I tried going long this morning and COMPLETELY messed up the entry attempts and then got stopped out before the grind higher began. By the way...thanks for noticing. I'll buy ya a cold one if this works out. You drink Bud? About half is standard stuff you'll actually see in any government contract put out to bid. The unusual stuff is in sections 3 through 6. Casino Royale.....Ponytail asian sittin at the poker table with "shakin not stirred"
I've never once referenced any post or chart by you regarding the NYSE A/D line, be it cumulative or non-cumulative. Not once. Not anywhere. Why is that? Because I am well aware that you do not use the cumulative NYSE A/D line, like I do. In fact, it was YOU that replied to my original post above. And in your reply to my original post, you clearly made assumptions not in evidence. Instead of admitting that you were mistaken and moving on, you (and your ego) continue to place the "spotlight" on yourself. Most successful traders that I know are freely able to admit that they're wrong. But you on the otherhand . . . can't ever get yourself to admit that you've made a mistake. It's amazing how you ALWAYS seem to turn everything INWARD towards yourself. Your paranoia is duly noted. Time to move on, if you can't admit your mistake. Amazing, really. That 188 day cycle is based on the theory of a heavy mass object. Don't know what to think. Of course I use the cumulative. It's been in my chart's list since 2002. "And in your reply to my original post, you clearly made assumptions not in evidence." No, not here. But you and everybody else on the other site are well aware of your attacks on me, when you name me personally, and on this very chart and this very topic. Who do you think you're fooling? Ah, Fukutu. 3 u's in his name. Lol... Mr. Fleming had such a sense of humor. To be honest I'd never noticed that spelling. Geez, I missed that conversation. Was that earthquake really forecast by cycles work? I'm not doubting it, just rather impressed if it were actually forecast. Katzo, you seem to be right on top of the earthquake scene. Do you watch it intentionally or are you picking up on the news from the media? Sat the day out as I couldn't get a read on anything and didn't want to give back what I made overnight. Things seem chaotic at the moment. Thought we had one more puch higher this week but now not sure. SLV is currently in Wave 2 pullback. PL had a chart for SLV a couple of weeks ago, with the low end target for this pullback around 29 - 30 or so. Then, up in Wave 3-5 to test last year's high. And, it will come down after all this. 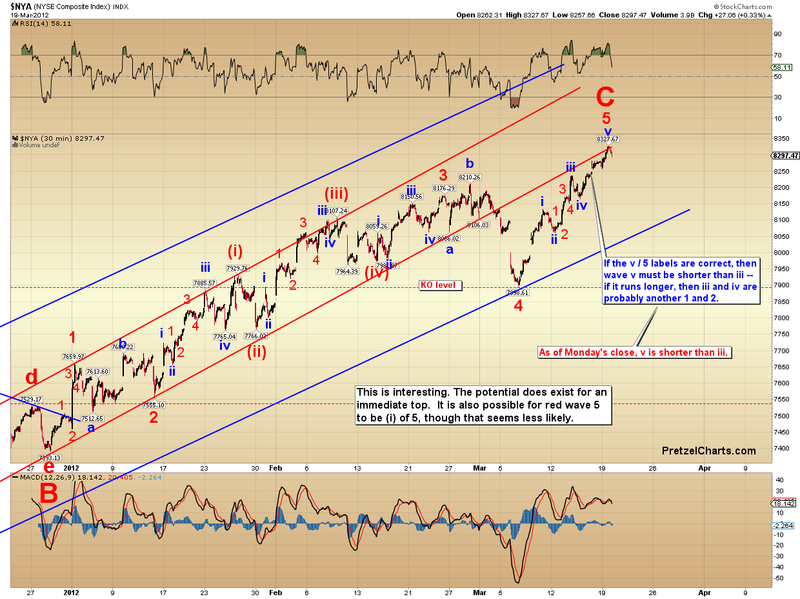 However, if it breaks below 29 some time during this pullback, we'll need to look at a different wave structure. Hope the cheese fatcories survived. Long AAPL with a Bull Put Spread (590/585) after it moved against the market today. Options expire end of day Friday. Can reverse/rollout at anytime prior to expiration for gain/loss depending on current price. Or like the Costa Concordia. Man, could you imagine seeing this image in person? How sad it is. Maybe he knows something that other people don't. Personally I would not be long right now but I don't run a hedge fund either. The longs I do have have been collared till June. With the vix so low it was cheap insurance and offset by selling otm calls. Just my opinion of course. Thanks for sharing that article. homeyG do you look for a .2 delta to trade normally? Just curious as to your credit spread strategy. Or do you look at the other Greeks as well. I had a spread on AAPL last week that worked out well but it got close. Thanks for your input. For those that follow RUT, it closed right up against that upper trendline from May/July 2011 highs AND most importantly for those short (like me); Pretzel's key breakout level of 833.02 held as resistance all day. So far, things are going according to plan, however, should they reverse then stops are in place and ready to be triggered. Look at the dates when he increased his long positions--they were near the local tops! "Biggs reduced the net-long position in the Traxis Global Equity Macro Fund to about 40 percent at the end of September before increasing it to 65 percent on Oct. 17 and 80 percent on Oct. 31, according to interviews with Bloomberg. On Nov. 21, he said he cut the level to less than 40 percent. On Dec. 2, he said he boosted it to about 60 percent. " Futures are up at the moment. Let's see what happens overnight. I went long 1 TF right before they stopped trading for day. I just got back from dinner and I we up 4.5. Not sure what happened but I will take it. If it stays here it might break TL. Looking to go short now. Exactly, t_winn. And he cut his holdings right around bottoms. Do moves in the pre or after market count on the charts when gaps are filled? Is current gap up on TF filling the recent gap? There is no discernable pattern there that I've been able to find. Sometimes a move in the futures acts a a surrogate for a move in cash -- other times it doesn't. But I have definitely seen it happen often enough where furtures move markedly higher or lower and thus fulfil a pattern in cash -- then reverse cash, just as if cash had done the work itself. If VIX is below 16.35 at the close tomorrow the short butterfly trade pays...... I am also in the April contract with the same trade. lol -- how do guys like this get to manage huge funds? He's trading like a small retailer! So many of them made their names by being bulls during the easiest bull run in recorded history (80's - 2000). Now that it's a secular bear market, they haven't the faintest. RTG - Shot ya a chart with my goofy version of a wave count and the other things I use to make trade decisions. Note that the NFLX chart and the AMZN chart are quite similar. So the expectation is that the trades are similar as well. Both report earnings in the May options contract. Anon? Where have I heard that name before? Amazed he hasnt resurfaced but bet he will when the bear finally gets rolling. I think 21.55 was time? Not sure. Looking in the 831-2 area. The Canadian Shield is actually in eastern Canada but I hear you. The west coast is pretty mountainy which is why the Asians like it so much, it reminds them of Hong Kong. But you betcha, the rock under there should make things shake pretty darned hard. And the liquifaction... man it could be just horrible down near sea level, right where the city is. I am long May contract 84/78 put spreads for the reason that I believe that the topping and turning process is going to be long and protracted. I do think that for the Russell the top has come but I also think until the starch comes out of the NASDAQ the Russell will go sideways to slightly up. I would be very surprised to see it get above the 845 level. So I am taking the longer view and working the trade in the May contract put options. AS we get better confirmation on the short trade via price and moving average entanglement I will add to that position. Not sure about Vancouver, Canada -- but Vancouver, WA and Portland, OR are in a zone 3 for seismic danger -- 2nd only to California in the contiguous US. I remember that from living there (Washington). Looks like that zone runs right up into Canada. lmao -- *there's* an excuse I haven't tried: "But, honey, the end of the world is coming!" AAPL is being run around by the options buyers and sellers. If runs true to form as it reports the day before options expiration in April it should drop like a stone sometime in the next two weeks just to blow out the long call buyers and screw with the short put sellers..... Look at last one year chart - look at period 1 to 3 weeks prior to reporting and see the action. PL quick question from last night, if it is wave 1 of 5 then a wave 2 of 5 should follow correct? If so what would be the anticipated measured move in such a wave? This is the trend line that I think is being tested right now. Either the test is complete or perhaps tomorrow the gap gets fulled and the underside of the trend line is tapped before a larger decline. We'll see, but for now it seems that this might be what lies ahead. Not to mention the fact that the Russell has been under-performing the S&P since early Feb. To me that's pretty clear evidence that the appetite for risk has been dwindling for about 7 weeks now. What's really bizarre (to me) about the whole thing is that Prechter himself stresses the importance of alternate counts in The Elliott Wave Principle -- but then in practice, they seem to completely ignore any other possibilities. Maybe it goes back to the old saying, "Those who can, do; those who can't, teach."